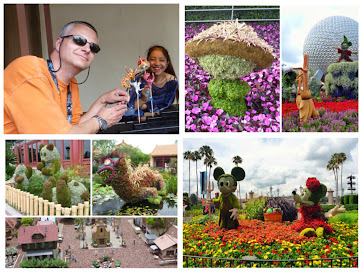 This will be the last post on our recent May trip to Walt Disney World. 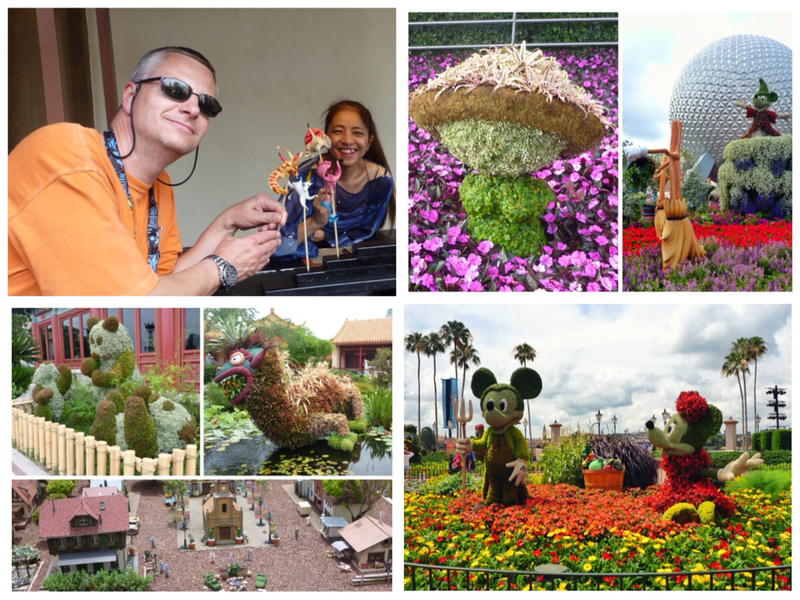 In earlier posts we covered some Flower and Garden Festival fun and the Everest Challenge 5k race/scavenger hunt. After checking in at Bay Lake Tower we had time to catch a late dinner at The California Grill. We both ordered the filet mignon. Holly's was a little overcooked, and Dave's was fine, but the side dishes were off. GREAT appetizers. Holly had the mushroom gnocchi and Dave had the onion tart. We split the kid's sushi dessert which consists of rice crispy treats with fruit roll-ups, Swedish Fish, etc. our waitress Jenny was lots of fun! 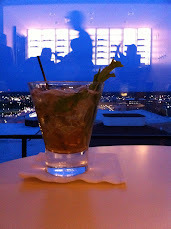 Afterwords we made it for a drink to the Top of the World Lounge in Bay Lake Tower. This bar is only available to DVC members staying at BLT on points. Thanks to the nice bartender Mike, we got to start our Blanton's whiskey bottle top collection. Lots planned for World Showcase today. We saved the world twice playing Kim Possible in Norway and The UK. We of course made it into La Cava del Tequilia right when they opened. Lunch plans were kinda up-in-the air and we lucked into a Via Napoli walk-up. Four cheese pizza and a pitcher of La Rossa because it's a better deal. After lunch we visited Tutto Gusto, Italy's new wine bar. This place rocks. Good wine selection by the glass, a few beers on tap, full bar, and decent food/dessert choices. We played Pick-a-Pearl in Japan, watched Miyuki make candy, and Dave tried on kimonos. No silky ones in his size so he didn't buy one. We caught a set from The British Revolution and our favorites Off-Kilter. 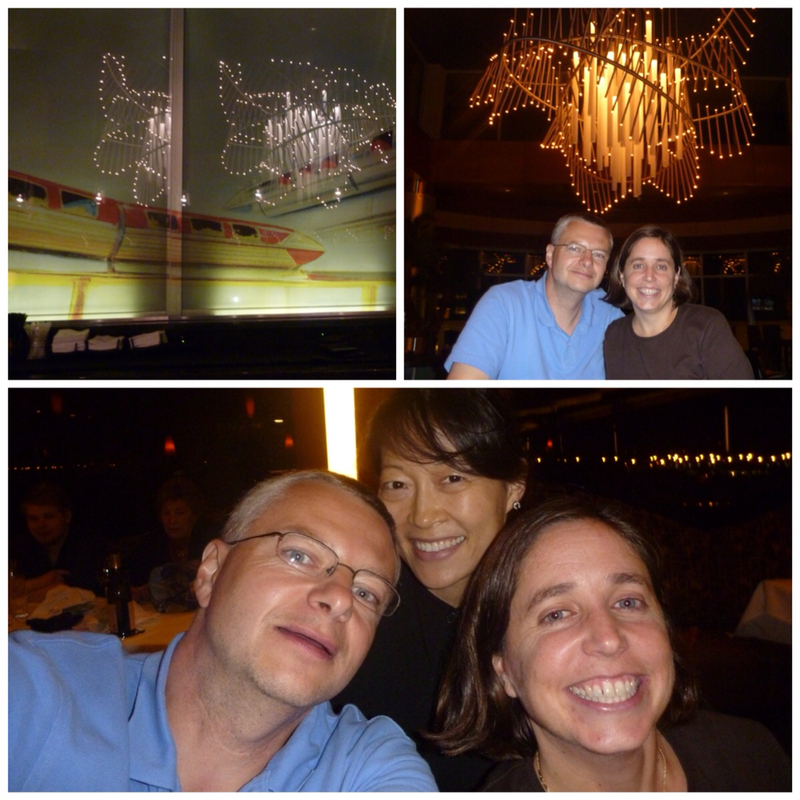 Dinner was at Bluzoo over at The Dolphin. It was not that great. Bad service, mediocre entrees.... Our last visit was better, but now having a second look at the menu it seems rather limited for our tastes. We'd absolutely go back for drinks at the bar, but that's it for now. We walked back to The Boardwalk and sat at the bar of The Flying Fish so Dave could get his favorite dessert: Banana Napoleon. We each tried flights while there: Holly had the pinot noir flight and Dave the dessert wine flight. Fun! We headed back via cab to BLT. 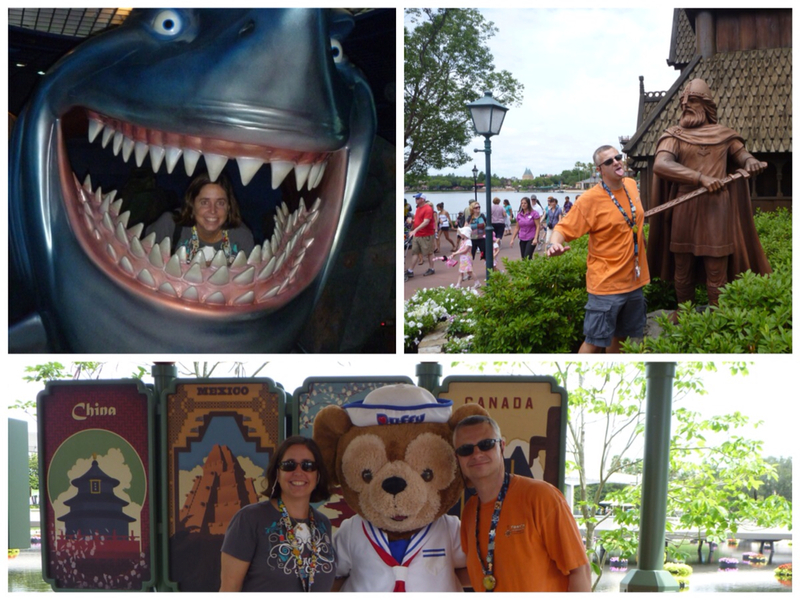 Next up was Magic Kingdom and race day. We checked out of Bay Lake Tower and put our car as close as we could to the MK walkway. 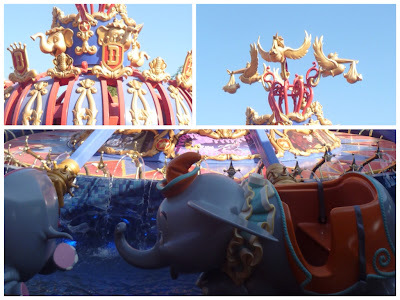 We watched the opening train station show and made our way into the park. As we power-walked Main Street a bunch of car dealership owners lined the street to welcome us. It was their corporate convention event. We bee-lined to the new Dumbo location and made it first in line. There really wasn't anyone behind us. We don't think people know it is open yet. The new ride looks good, but we missed Timothy Mouse on the top of the ride. 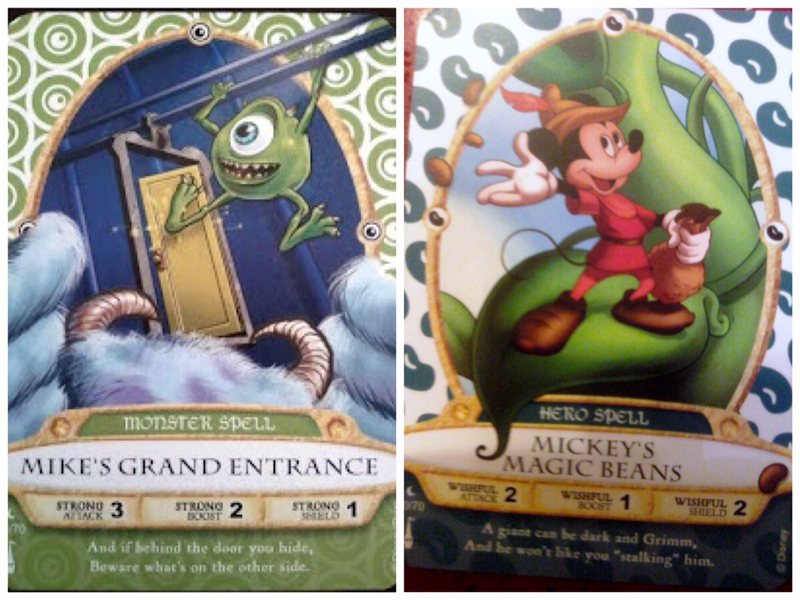 We also gave Sorcerers of the Magic Kingdom a try. This is a new game that is a cross between Kim Possible and Pokemon. Players get a key card, 5 character spell cards, and a map. Players visit portals (video screen) around the MK and use their spell cards to beat the villains. You get new cards each MK visit and your cards level up the more you play them. There are 70 cards and they make nice collectibles. This has the potential to be fun, but it's slow. You end up waiting on lines all day (and lines not for attractions) because it's popular and games can take 2-5 mintues a turn. We quit after our 2nd terminal. 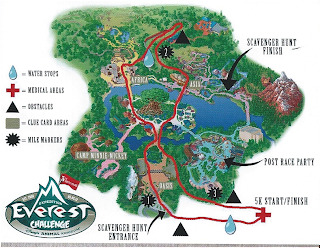 The rest of the day was covered in our Everest Challenge race report. 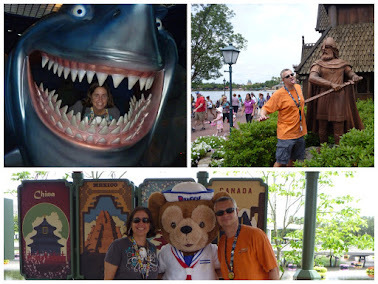 We spent the rest of the day doing what we do best: Walking around the World Showcase. We watched some Off-Kilter, enjoyed ciders in The Rose & Crown, played our last Kim Possible in France, visited Tutto Gusto one more time (where Dave started to spontaneously combust), toured more F&G Fest displays, etc. we left relatively early and ended up packing up to leave the next morning. Before dinner we went to the animal viewing area of Jambo House, participated in the marshmallow roast, sat by the fire pit and had a drink at Victoria Falls Lounge. We enjoyed a great meal at Jiko which included favorites such as the wild boar, BBQ flat bread, and filet mignon with mac and cheese. After dinner we used the night vision goggles to view animals and watched some of the outdoor movie by the pool (Winnie the Pooh). After that it was time to pack it in and get ready for our 3:30am wake-up call. Once again another great trip. 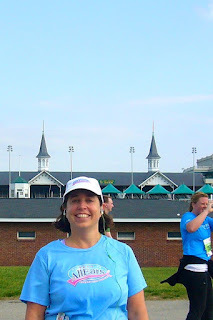 About this time last year we were planning to go to Cincinnati so Holly could participate in 2012's Flying Pig Marathon. 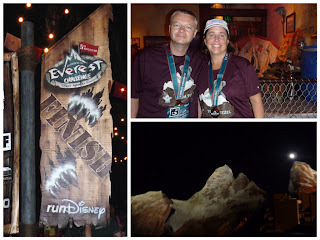 A few months later we found out that RunDisney would host another Everest Challenge race in 2012 on the same weekend. Holly didn't have to think twice. We were ditching the pig for The Mouse! 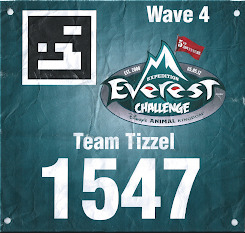 Everest Challenge is a relatively small race and it could be retired any given year, whereas Pig will continue to fly. 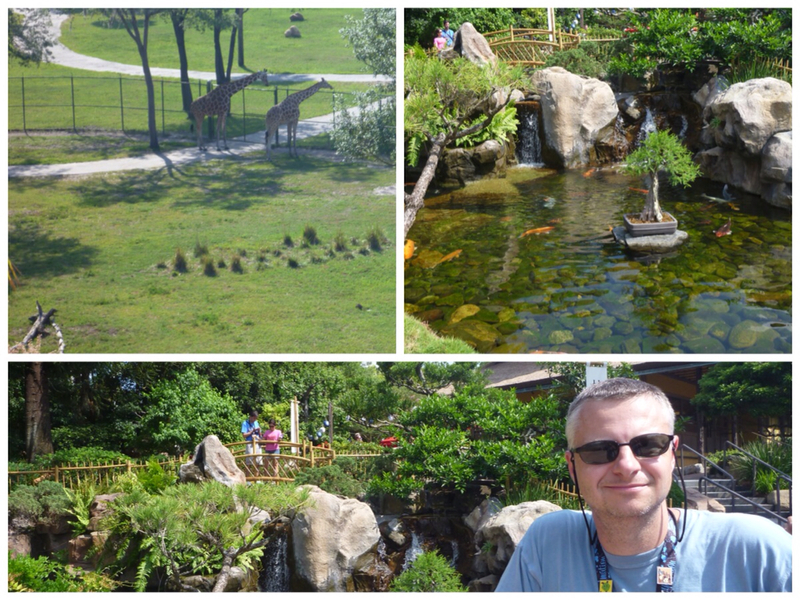 We split our four night stay between Bay Lake Tower and Animal Kingdom Lodge. We picked "The Lodge" so we could be at one of three host hotels race day. That meant bus transportation to/from the event. We spent the morning of the race (Saturday) in The Magic Kingdom, then drove our rental car to Wide World of Sports to get our packet. There were other events happening at the complex and parking was a challenge. The packet pickup was outside by one of the ball fields and was relatively small and efficient. Only merchandise for sale were two event shirts. They did have a little vignette for a photo opportunity. 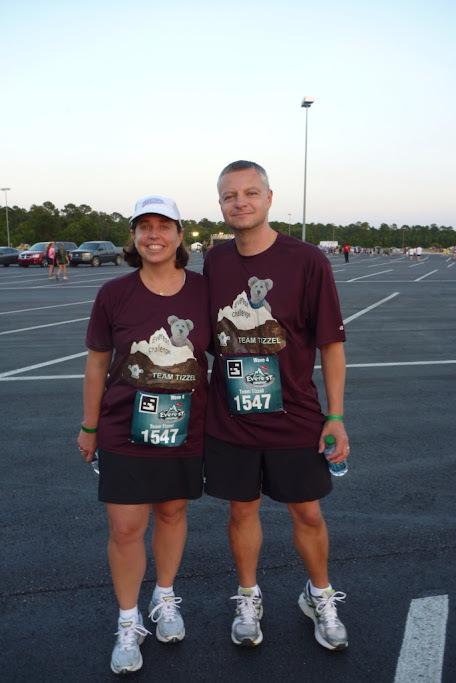 We probably spent ten minutes performing the packet pickup and 30 minutes parking and walking. We left our hotel around 7:30 via bus. Right when we pulled into the Animal Kingdom bus depot we realized Dave did not bring his heart monitor (he needs to keep under a certain BPM level). 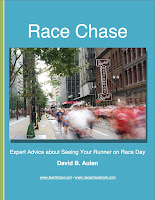 After a few moments of debate we opted not to go back for it and let Dave keep a lower pace. 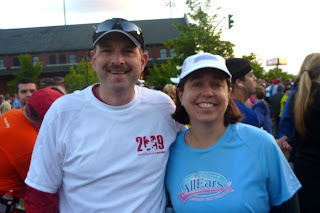 We met up with several Team AllEars members and chatted up until race time. This race had 8 waves, each starting 6 minutes apart. The first wave left late - around 9:33. 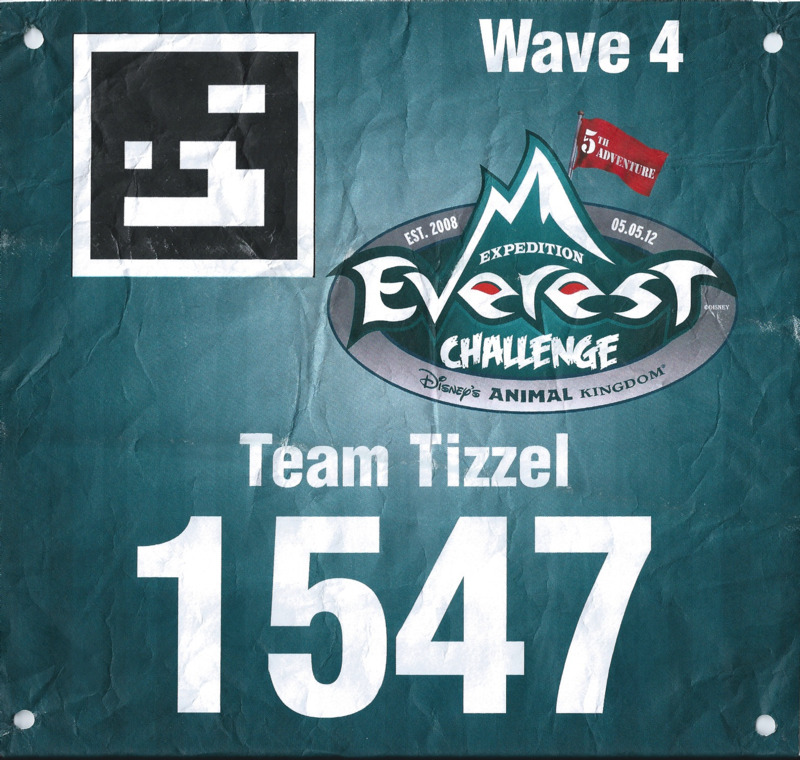 We were assigned to Wave 4, but we took advantage of the confusion in the corrals and left with Wave 3. Just like Waves 1&2 we were sent off with a countdown and fireworks. Mile 1 was mostly through a parking lot. 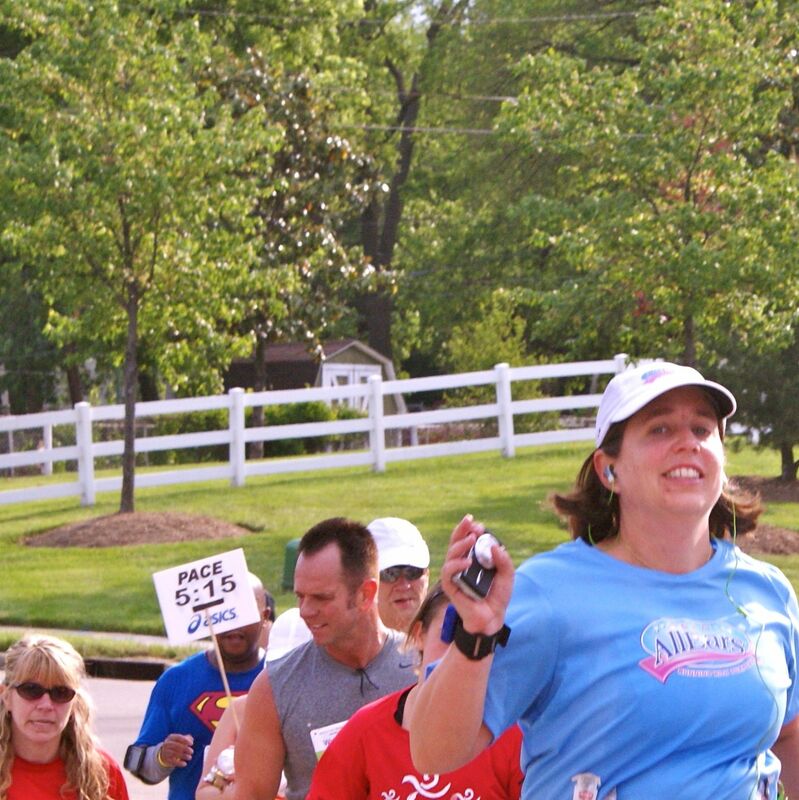 We were walking this race with our pace between 13.5 - 15 minutes per mile. Good thing because it was warm and humid. We hit the first obstacle about mile mark 0.8. There were many rows of hay bales for us to hurdle. No big deal and you could skip obstacles if you wanted to. As we approached the main gate we were directed to the path from the bus depot, which is about 3-4 people wide. This slowed us down. The actual mile marker was right before the turnstiles. 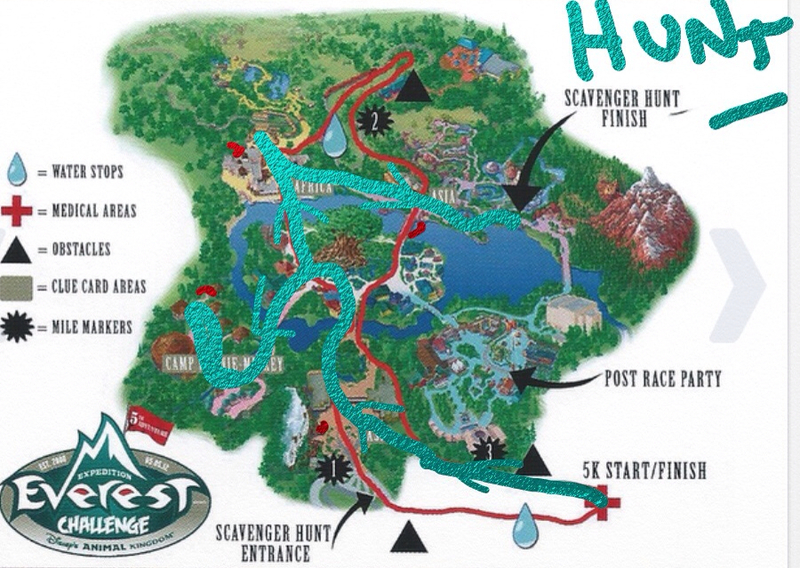 Mile 2 took us through The Oasis, Discovery Island, then turned left towards Pizzafari. The park looked great at night. We headed towards Harambe and ended up backstage for a good portion of this mile. We went by Conservation Station's train depot and could see the animal care areas. The obstacle this mile was staggered tires to walk through. Another bottleneck. Mile 3 looped us back toward the center of the park and we took the bridge by Yak and Yeti back to the front of the park. We took another backstage leg to the last obstacle. This was a short military crawl under some netting. Easy enough, but we noticed some people huffing it pretty hard. The Curse of the Night Race strikes again! We finished close to where we started. Once you finished the crawl the 5k was over. Now time to do the scavenger hunt. We were handed a clue card, sharpie, and led flashlight/whistle. The goal was to solve the riddle, and show the answer to a volunteer at a designated checkpoint. If you want to see the clues, watch the first video at the end of this post (or click here). Clue #1 was easy. We wrote down our answer and took it to our assigned checkpoint right before the turnstiles. The volunteer confirmed our answer was correct and gave us the next clue. Clue #2 was also easy. We were now being sent to Camp Minnie-Mickey. Here's where the course got annoying. It was narrow to start with. Now you have runners going into a dead-end of the park that will then have to go back the same way again. People were running into each other, pushing to get ahead, and the clue area was just a mess with people. We had the right answer and moved on. Clue #3 was also easy. We were sent to Harambe. Back through the mess of people coming into Camp Minnie-Mickey. For the second time in a row our checkpoint was the farthest of them all (by Kilimanjaro). We got our clue and took off. Clue #4 was also easy. We were sent to Asia for our next checkpoint. This time we were the first stop just after the drum section. Final Clue: Required the answers from the previous clue. We worked quick and took off. About 50 paces later Dave realized he may have screwed up. He was right. We corrected our answer and took off for the finish line. 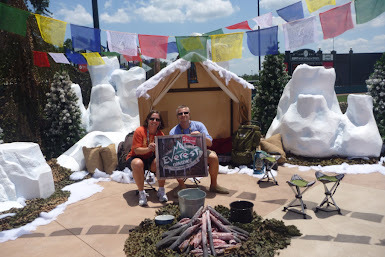 We showed our answer to the volunteer by the monkey cage and were sent on our way towards Expedition Everest. The finish line area was packed and unorganized. Volunteers couldn't grab medals to hand out fast enough. It was difficult to make your way to the water, bananas, and Clif Bars. To make matters worse, the first beer vendor couldn't give us change so we had to go 50 feet further to the next cart. We were scheduled to meet up with our friends at Expedition Everest, but we decided not to linger in that area given the crowd. Turns out no one went to the team meet. We spent some time touring Dino Land at night. We rode Dinosaur, Triceratops Spin, and Expedition Everest twice. We watched the dance party and the Goofy/Pluto meet and greet. We skipped Primeval Whirl and Kali River Rapids. Lines were relatively short for the rides we went on. At 12:30 or so we grabbed some dinner at Restaurantosaurus. called it a night around 1:20. We boarded the Animal Kingdom Lodge bus and were back in the room in no time. Overall this was a fun event. Our 5k time was 44:12 and clue hunt time was 30:22. We enjoyed the clue portion of the race and liked having the opportunity to see the park at night. The after-party was fun and there were enough places to get food and drink with limited lines. RunDisney needs to be a bit upfront with folks to let them know their total distance covered during the event is closer to 4+ miles. There has to be a more efficient way to layout the course so participants aren't banging into each other and bottlenecking. We didn't check a bag but heard that some people had to wait 45 minutes to get their stuff. We'd do this one again! We have two videos. The first one we filmed during the event that evening. The next video was shot the day after with our recap and armchair quarterbacking. 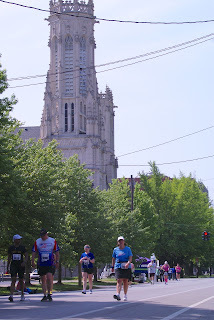 This was my last marathon for the Spring season and my legs were feeling it. I was however a bit optimistic. We drove down to Louisville on Friday and got there in time to pick up the packet at the Expo. 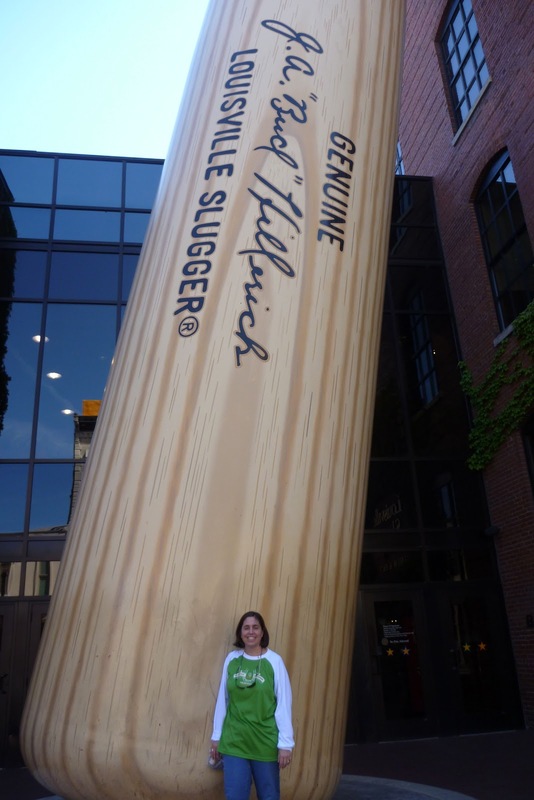 We had just enough time to make it to the last tour at the Louisville Slugger factory and museum. It was pretty neat and I would have liked to have more time. We had an ok dinner at Blu Italian Restaurant and then off to bed for another early start. We could walk to the start from our hotel and it was a cool morning. The weather was once again predicting storms. I was hoping they would stay away. We met up with a fellow Team Allears member, Stan Harris before the race. It was nice to see him beforehand. He did great in the half! The race start was a crowded one. They had the bugler from Churchill Downs blow the traditional call to post. I got emotional at that one. It took me about 12 minutes to cross the start line and I told myself to keep it slow. I have decided that 11:45 or so is my normal pace and I can’t go slower on race day. 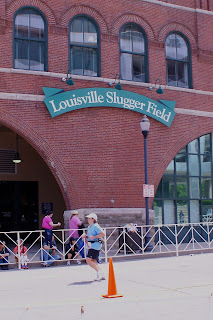 Saw Dave at Mile 1 and ran by the big bat at Louisville Slugger. It rained for about 5- 10 minutes around mile 3 and that was it for the bad weather. It was cool for the first half and then got warm around the end. Saw Dave again just as we entered Churchill Downs. It was so cool to run down in the tunnel, under the track and come out on the infield. I stopped here a few times and got a few pictures. I asked one woman to take my picture and thankfully she obliged. I of course returned the favor. 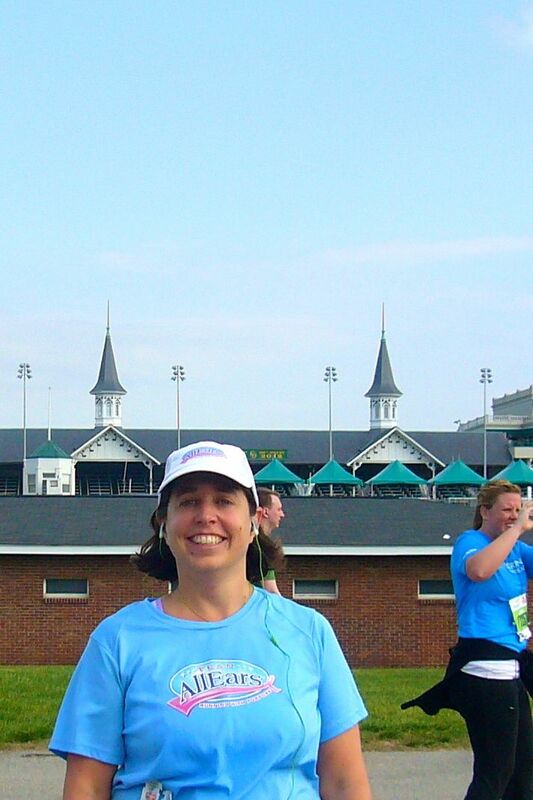 After Churchill Downs we split from the half marathoners and it got MUCH less crowded. We then had a long out and back portion. 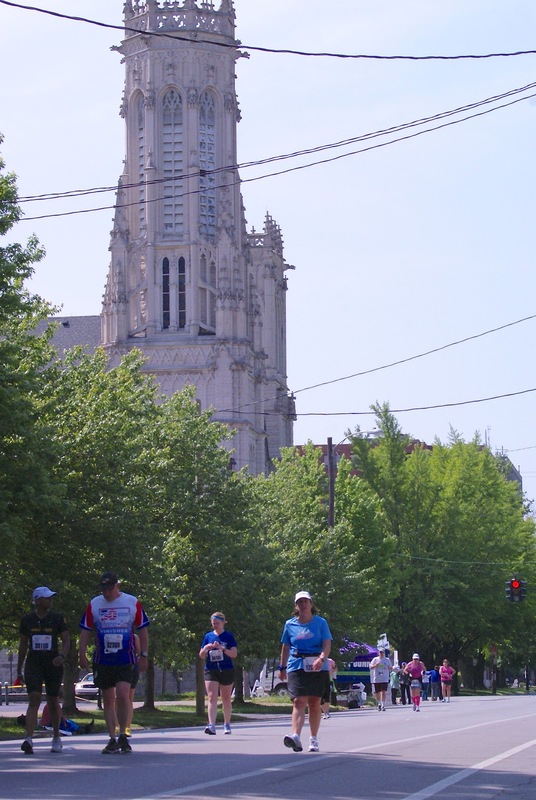 The course had been totally flat so far and I was feeling really good. I switched back to Heed for my electrolyte replacement and I think this helped. We then ran into Iroquois park around Mile 11. This was a beautiful park, but had some serious hills. I kind of enjoyed them. I think it breaks up the monotony on the muscles and I felt great after leaving the park at Mile 15. Saw Dave again here. Feeling good and on perfect pace up to Mile 20. Saw Dave and then started to fall apart. Not sure what is going on lately. I think it is a more of a mental breakdown than physical. 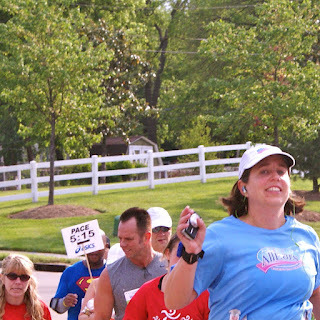 I kept saying to myself, I’m too tired to keep running 4:1. I was craving a Sprite and almost stopped at a gas station. This was also where some serious hills were. I ran into a 50 states member and talked to her for about 5 minutes, all while running with her at a faster than normal pace. This leads me to believe that I am having the mental breakdown. I got it together at Mile 24 and finished up strong. 5:25:14. This was my third fastest marathon. I was happy with it, but disappointed at the same time. I was on pace for 5:15, not a PR, but feel that should be possible more often for me. On a happier note, I loved my medal and I checked off another state! 11 states down. Also that Marathon bumped me up to Silver, 2 star Marathon Maniac Status! 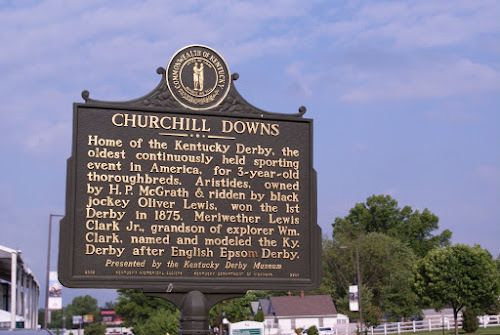 I had a round-about route to Churchill Downs and made it in plenty of time to see Holly enter the track. While there I spent some time talking to their head of security. His "tax season" was just about to begin. I made it to miles 15 and 20 with little difficulty and luckily made it to the finish with about and hour of wait time before Holly would come into view. 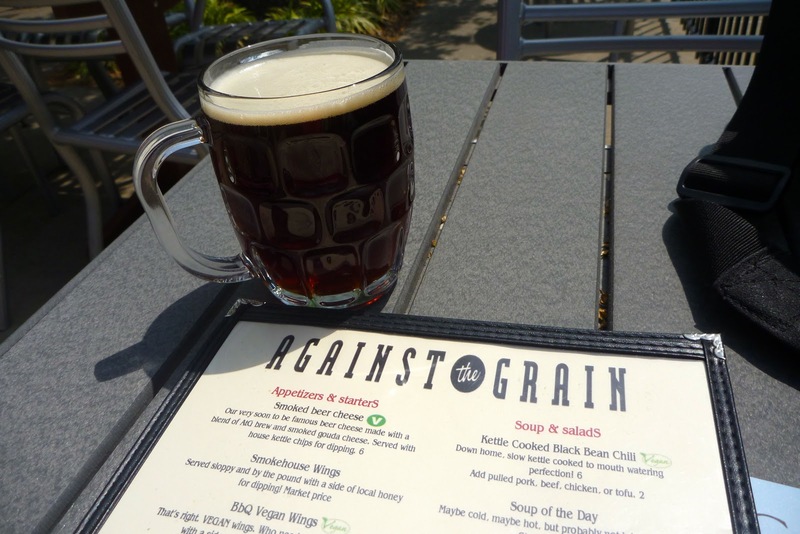 Every marathon needs a brewpub at mile marker 26.1! 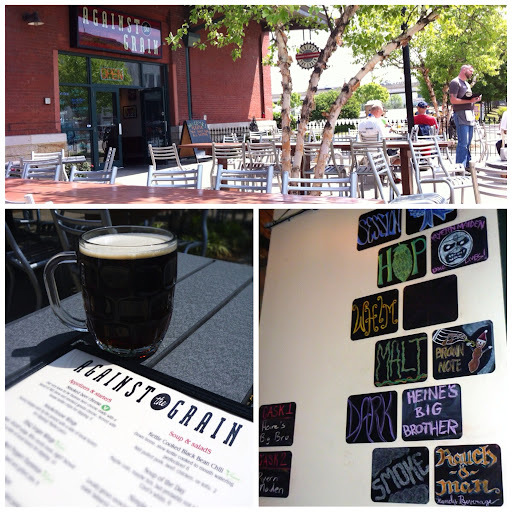 I got to sit for an hour at a brewpub instead of the usual park or corporate high-rise no-mans land on the weekends. After the race we had a great time checking out Bluegrass Brewing, Under the Bridge, 4th Street Live, and Jockey Silks at the Galt House hotel. 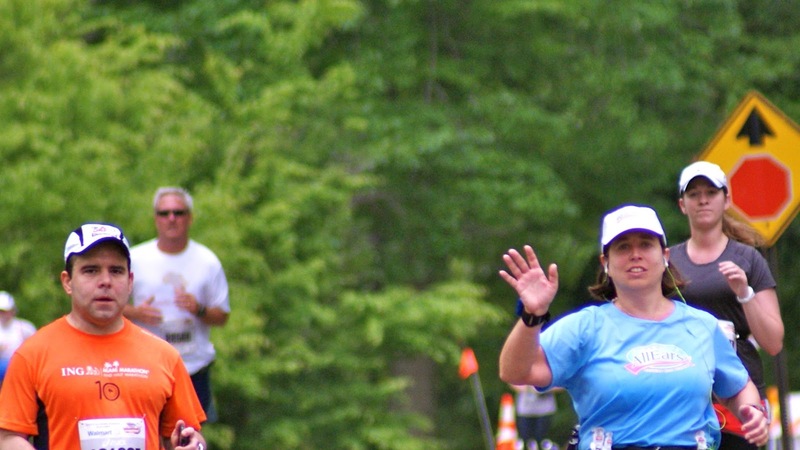 Here's Holly's race video from the event - featuring our friend Stan. 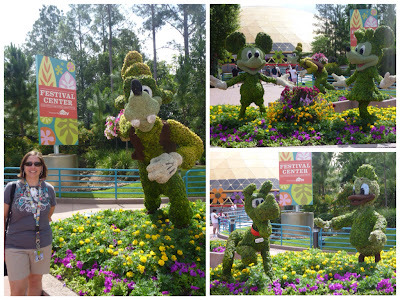 While Team Tizzel was in Walt Disney World participating in the Expedition Everest Challenge, we had a chance to check out Epcot's Flower and Garden Festival. 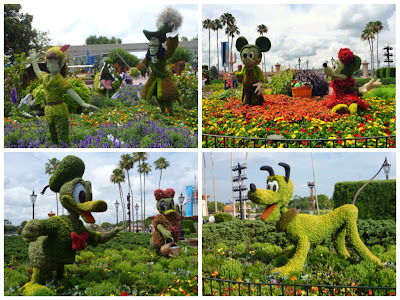 This event lasts for several weeks and includes special exhibits, demonstrations hosted by HGTV personalities, flowers all over the place, and many Disney-inspired topiaries, and concerts by well-known artists. Epcot looks its best during the festival and we'd love to see some more flowers year-round. For more details check out the official WDW site or AllEars.net. 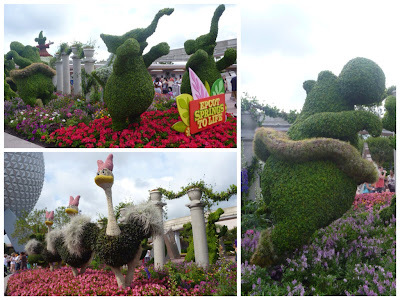 There are so many topiary displays. 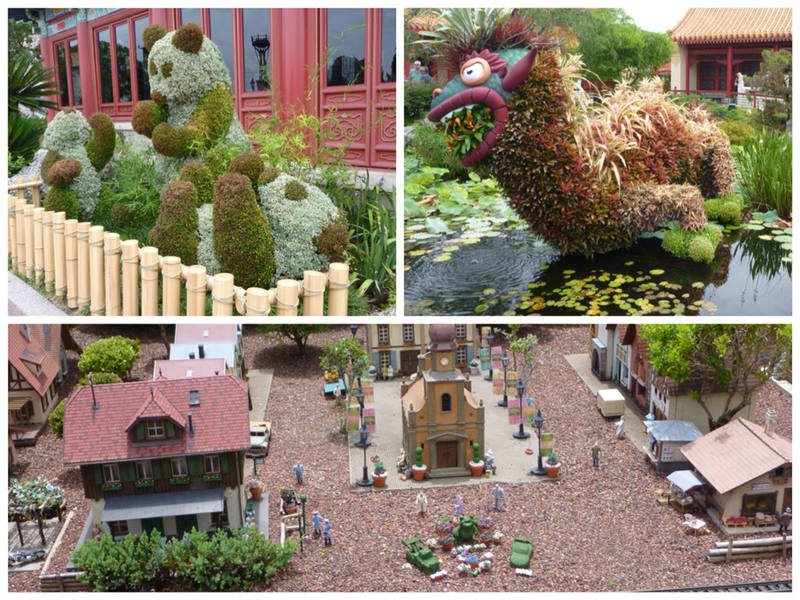 While many of them are reused each year, they seem to shift position or are displayed differently each year. 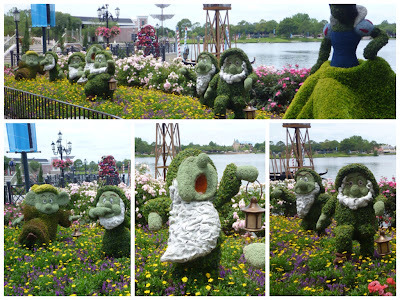 We'll take a look at some of the topiaries and where they are located in the park by using references in the official festival guide (borrowed from Mickeyupdates.com). 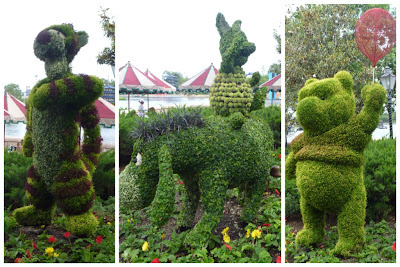 Fantasia topiaries are at Epcot's Future World Entrance (map 1). The positioning of Sorcerer Mickey on the smoking rock presents a great angle for photgraphing with Spaceship Earth in the background. We're used to this Bambi setup in the Canada Pavilion. This year it's positioned in the butterfly house (map 8). Of course Dave had to pose by his favorite character, Thumper. 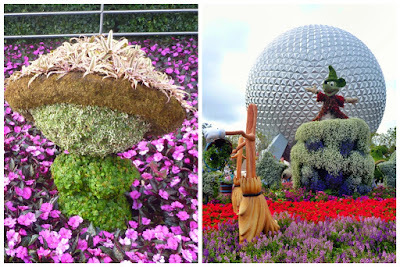 The Disney reference for the peacock topiary (map 2) is lost on us, but it's pretty cool use of the space behind Spaceship Earth. 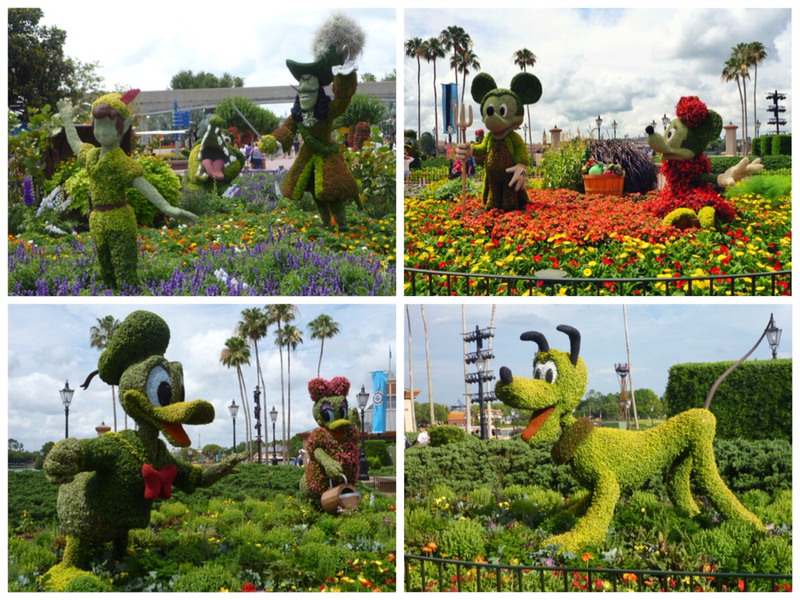 We believe a few years ago these topiaries of the Fab 5 had a sports theme overlay. This year they are presented in a straight-forward manner outside the Festival Center (map 3). Holly posed with Goofy since she loves The Goofy Challenge race event in January. Over by Mission Space (between map 3 and 5) is Stitch. Pixie Hollow (map 6) is designed to look like the land Tinkerbell and her fairy friends live and usually has ties to the next direct-to-home video. 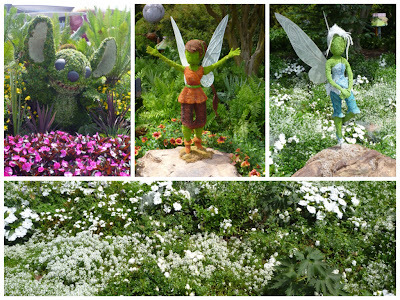 This year we meet Periwinkle the snow fairy (thus the white flowers). On the Future World side of The World Promenade (map 7) is the Peter Pan display. At the other end (map 12) is Farmer Mickey and friends. 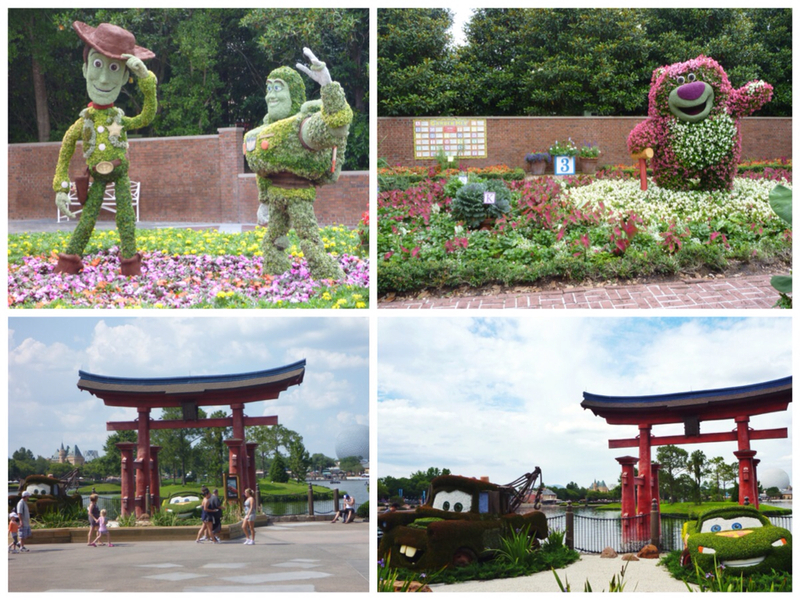 Some of the World Showcase Pavilions get in on the action. China (map 26) has the panda and dragon displays. The train village in Germany (map 24) also celebrates a Flower and Garden Festival. 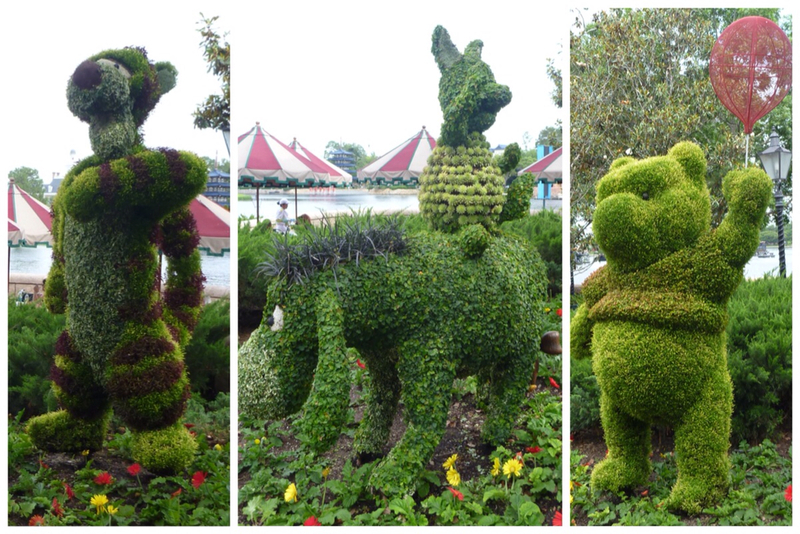 There's Lotso and Cars topiaries too. Also in Germany is the Snow White and the Seven Dwarfs display. 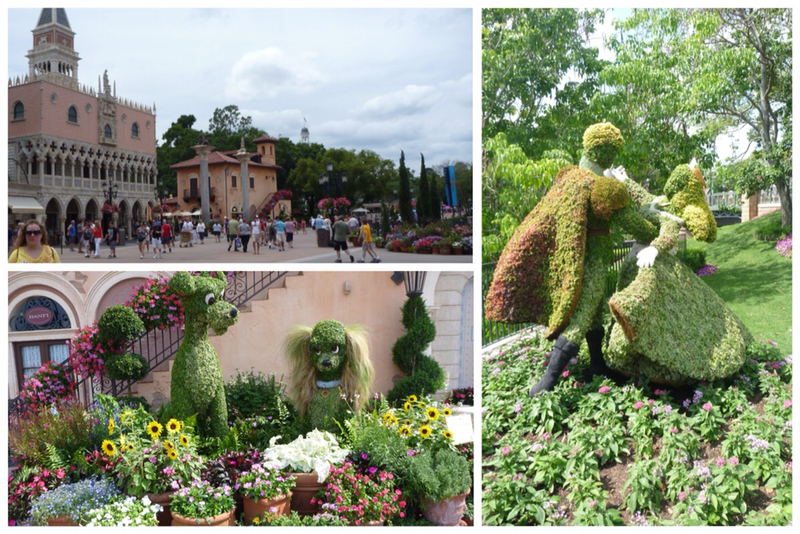 In Italy you can find the Lady and the Tramp topiary (map 23) and by the bridge between France and the U.K. Are Disney Couples topiaries (map 16). By The American Adventure (map 21) are the Toy Story characters. By Japan (map 20) is the Cars 2 display. They went to Tokyo in the movie - linking them to this location. Winnie the Pooh and friends (map 14) hang out by the English Gardens in the U.K. pavilion. There are more topiaries and other displays to check out. This really is the time to see Epcot looking its best. For whatever reason, we seemed to notice the historical markers around Louisville. 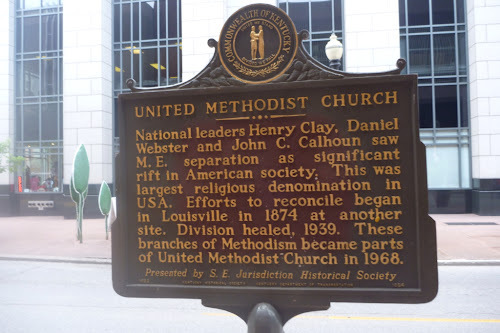 We were surprised to find out Charles Dickens visited Louisville. 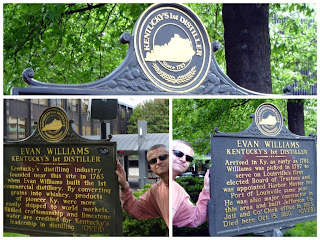 Here are some of the markers we encountered during our weekend. We showed this photo in our last post, but it was one of few two-sided markers we found. We'll have some great reports coming up including Holly's Kentucky Derby Festival Marathon race report and video, our Expedition Everest race report, and some other posts from our recent Disney trip. You may see a few posts out of chronological order, so don't worry if you think you missed something. 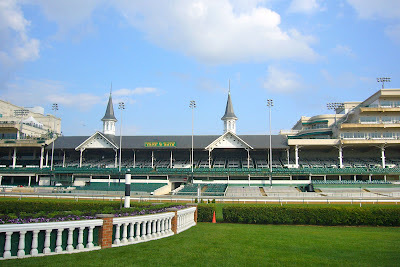 We spent two nights in Louisville, Kentucky this weekend. 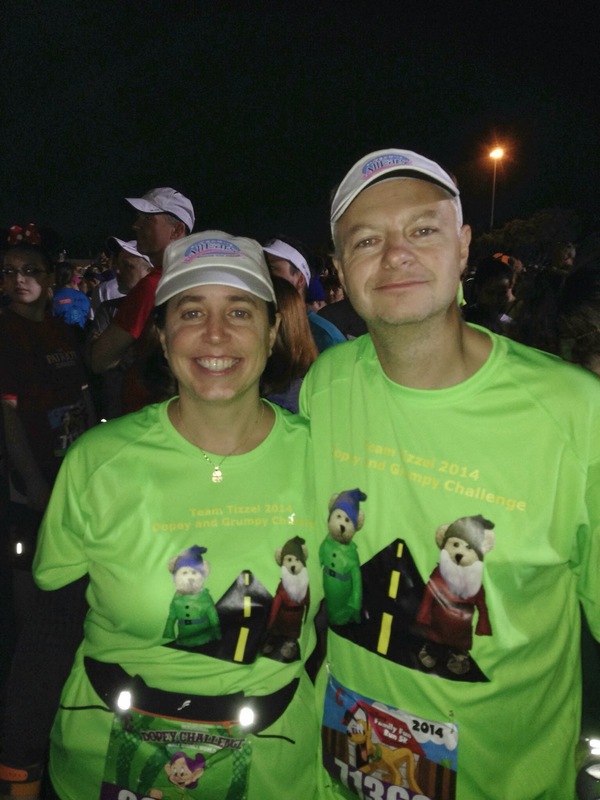 Holly ran a marathon (race report to follow) while Dave followed around. 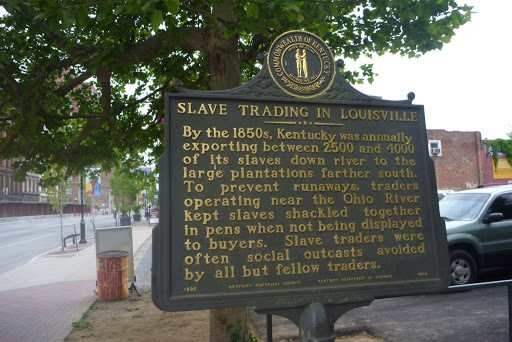 Louisville was not a town we researched much before arriving. In fact, Dave was googling the whole ride down to try to figure out where to find brew pubs and a good bourbon bar. We were lucky to have easy access to both! We stayed at Galt House, which is a large convention hotel right on the Ohio River. 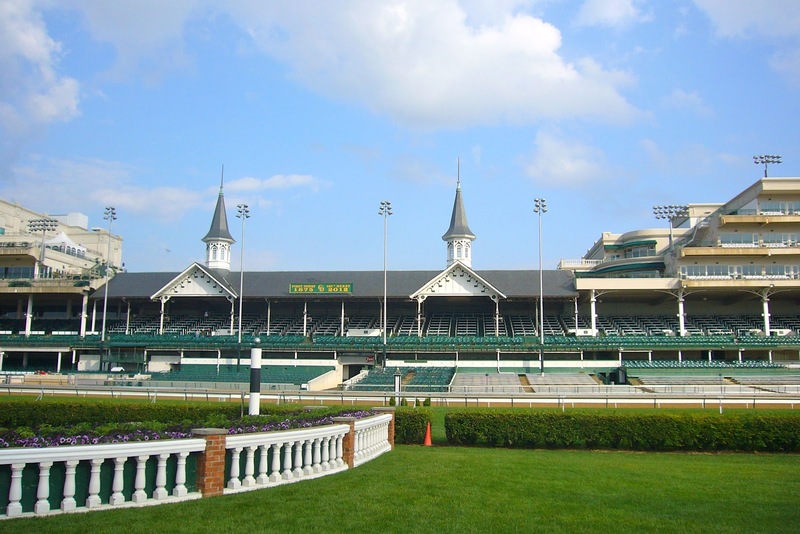 It's in the heart of Louisville's tourist district. 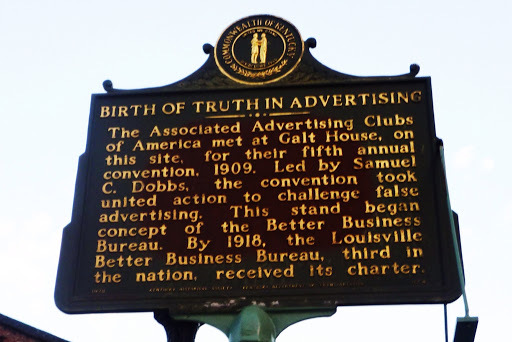 Right on the property of Galt House is this historic marker commemorating the fact that bourbon was first produced near this location. How close? Two blocks, two miles, two towns over? 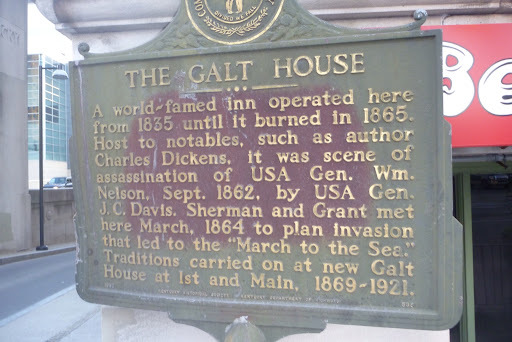 Does that location have a sign saying Galt House Hotel is near them? Inside Galt House is a bourbon bar called Jockey Silks, which claims to have the largest bourbon selection in America. We'll cover more on that location later. A block from our hotel was one of several Bluegrass Brewing Company locations. We visited the 3rd and Main location twice. Once before dinner on Friday, then again for lunch on Saturday. We both enjoyed the Nut Brown and the Porter. 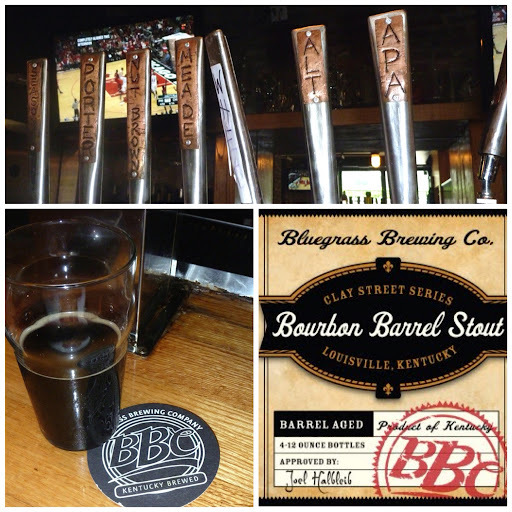 Dave also ordered the bourbon barrel stout, which you would think he'd like.....Nope! These two great things did not taste great together. Surprisingly he did like the Bourbon Barrel Blonde Ale he had with dinner that night. BBC was a great place for burgers. While Holly was running the marathon Dave got to visit Against the Grain Brewery. 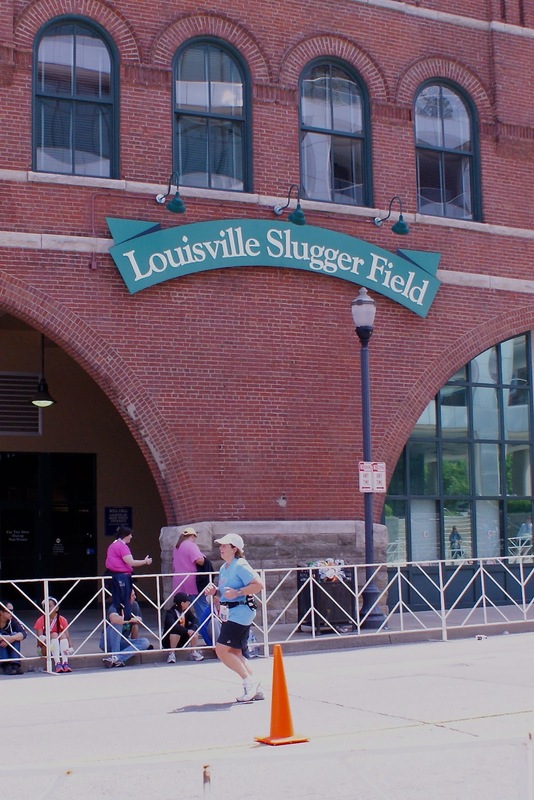 This business is conveniently located in the Louisville Slugger minor league ballpark and at mile mark 26.1 of the marathon course. This brewery will have beers on tap matching one of six styles including session, malt, smoke, and hop. Dave tried the malt offering of Nut Brown and the smoke offering. The nut brown was a bit light in his opinion and the smoke......since it's made with burnt wood the first sip was like drinking a pork sandwich. It got better after that first sip, but still it was an odd sensation. Good news is beers in this town are relatively cheap: $4.50 at this location. Now onto the bourbon. 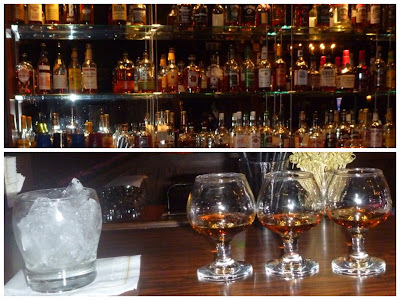 Dave sampled flights of bourbon at two locations. The first location was at Maker's Lounge in the area known as 4th Street Live! Maker's Lounge was a modern style lounge/high-end bar and we felt a little under dressed in shorts and t-shirts. They had a large cocktail menu that featured drinks with or without bourbon. 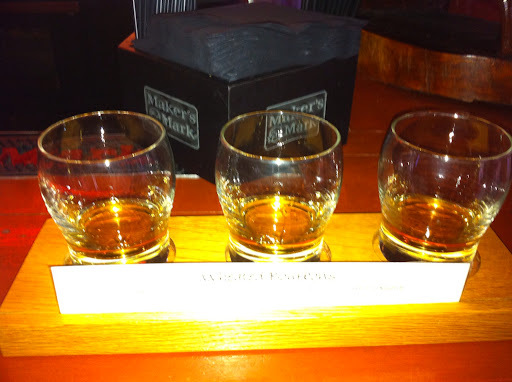 You could buy bourbon individually or in flights of three (1/2 oz each). Flights were grouped by style and you were instructed to sample left-to-right. Flights were served straight-up with a glass of ice on the side. After you take your first two sips of each one you were supposed to add ice to help dilute and mellow the alcohol. Dave tried the Wheated flight that contained Maker's Mark, Old Fitzgerald Prime Bond, and Weller's Special Reserve. Maker's Lounge is where we learned about Blanton's Bourbon. There was a display on the bar that had a bottle of Blanton's with 8 bottle tops circling around a merchandising display. 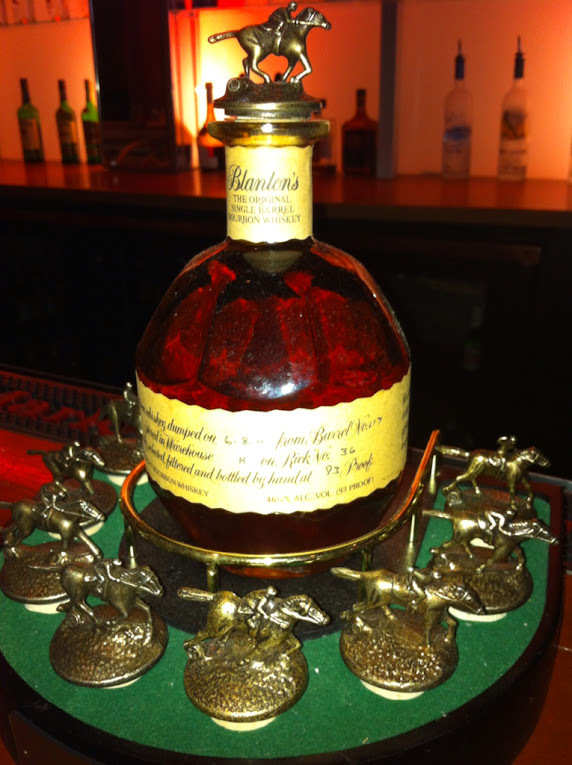 The bartender explained that there are 8 different ones, each with a letter in Blanton's on it. Each jockey had a different pose. Looks like a new collection may be forming. Later on that night we went to Jockey Silks in our hotel. This was a great space and reminded us of The Chart Room in Key West. Dank, lots of wood, popcorn machine. Dave wanted to get flight, which was available, but I had to come up with my own. We were handed a piece of paper with the names of all their bourbons and prices. No groupings or flight pairing suggestions. Dave expected a little more from America's biggest bourbon selection. He ordered a Blanton's and asked the bartender to give him another one with "a horsey painted on the bottle" and a Buffalo Trace.